Following the instructions of His Guru, Shri Babaji Maharaj took the decision to construct an ashram in Laxmangarh. The foundation stone for the ashram was laid on 23rd March 1972. Subsequently, foundation stone for the construction of ashram temple was laid on 28th May 1972. The foundation stone as well as inauguration for the opening of ashram was conducted by Mahant Shri Hanuman Nathji Maharaj on 17th July 1972. During the ceremony, many thousands of devotees welcomed Mahantji who was also accompanied by many other saints. Chanting and bajans continued through out the night and in the morning, with the fire ceremony (yagya), laying of foundation stone started. From that day onwards Shri Babaji Maharaj started living within the ashram although from time to time He continued to visit his devotees or places of pilgrimage. There was prasad (offering to the God) in the morning in which everyone took part. Mahantji stayed through the day and he was bid farewell in the evening with all the respect and honour. 2 In the west prayer hall was constructed. Kitchen is towards north-west and there are corridors all around it. 3 Towards north-east are 6 rooms for saints and there is verandah all around it. Every day thousands of devotees came to ashram. They would typically first go to Shri Nathji’s temple, then visit the cave to see Guru Gorakh Nathji’s painting. At the back, they would visit Shri Hanumanji, Shri Ramdevraji and Shri Gogaji. The atmosphere in the ashram was very serene and peaceful. They would enjoy the company of Shri Babaji Maharaj and get his blessing to lead a pious and happy life. Before taking Maha Samadhi, Shri Babaji Maharaj declared Shri Baij Nathji as head of Laxmangarh ashram. Subsequently, three other disciple monks have established new ashrams at different locations within Shekhavati region. Each of these ashrams is situated in Shekhavati region. 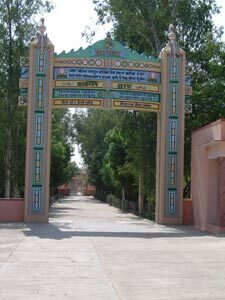 Laxmangarh ashram can be reached by either road or by train from Sikar. Om Shanti (peace)! Prem (love)!! Anand (bliss)!!! Om Shanti (peace)! Prem (love)!! Anand (bliss)!! !